Division has been updated so it defaults to the original invoice. Credit Notes can no longer be back dated into locked accounting periods. Once returned items are received via inwards goods an item adjustment displays the credit note number. Gross Profit Report has been updated to display credit note data. Once accounts has exported a line item it can no longer be reverted. Supplier Credit Notes will need to be created. 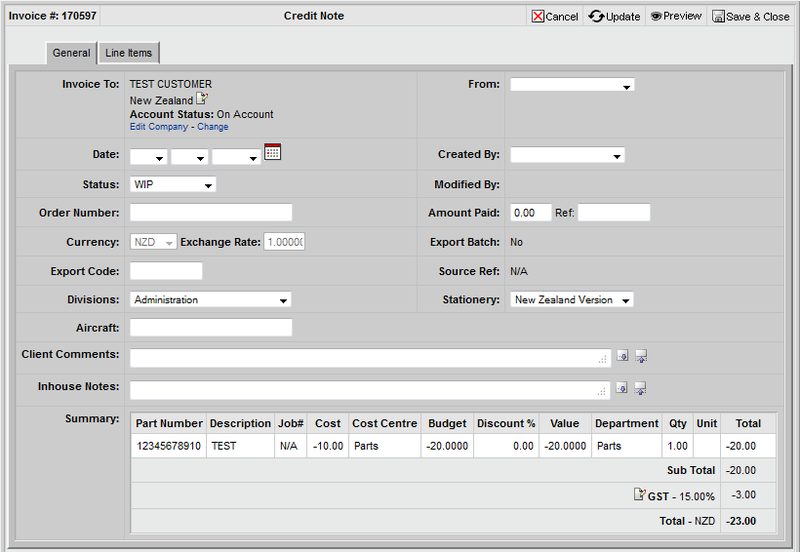 Supplier Credit Notes can be created for both parts and materials line items. When Supplier Credit Note has been closed the items will be removed from stock. Note - Purchase Order Data/Supplier Credit Notes cannot be back dated into locked accounting periods. For further instructions please click here. Advanced Search option has been added to Companies Module. It is now possible to search by Account Status, Shipping Method, Discount Rate, GST Rate, Group and Credit Limit. When deleting records from the Companies Module users will be alerted if any transaction history has been created and can confirm or cancel the deleting process. TDs can now be cancelled using Set to Void option. Accounts Details Tab is now permission based. If users do not have permission to view the Account Details Tab the following screen will display. Update permission using either the Groups Module or the Users Module. Once the permission is updated users will have to log out and log back in to activate. Type "Ship Via" is now available so users can set up their specific shipping methods. One list is displayed in four modules - Companies Module, Orders Module, TD Module and Invoice Module. PDF Stationery can also be updated to display this data, please contact Module for details.